Authors of a new study claim that it is safe to revaccinate children after they have suffered an adverse reaction, particularly when if the first reaction was mild or moderate. Canadian researchers analyzed almost 20 years of records for 5,600 children for whom an adverse vaccine reaction had been reported. Of those, 1,731 were available for follow-up, including 1,350 who had been revaccinated, with 16 percent having experienced a second adverse event. 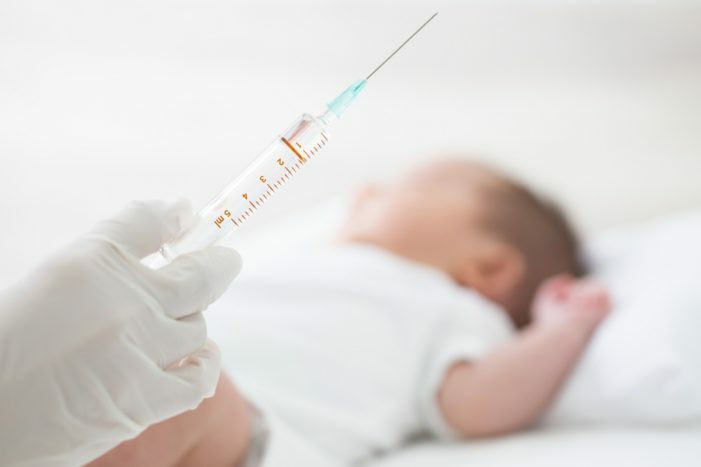 The study did not consider any of the genetic, biological or environmental factors that could contribute to an increased risk of a vaccine reaction. Researchers noted that those children who had experienced a more severe reaction were less likely to be revaccinated (60 percent compared with 80 percent of those who had milder reactions). They also reported that for the 16 percent of patients who experienced a second adverse reaction on re-vaccination, “In more than 80 percent of cases, the recurrent reaction was no more severe than the initial reaction. This means that 16 percent of the children who had a first reaction to vaccination reacted badly to revaccination, and for 20 percent of those, the adverse event was worse than the first one. This one-size-fits-all mindset presents a danger for those with genetic, biological or environmental high risk factors that give them a good chance of falling into that 20 percent. Those are the reactions that need to be screened for and prevented in susceptible children. Assume for the moment that vaccines work the way vaccine manufacturers, federal health agencies and the American Academy of Pediatrics insist that they do. Even the most rabid promoter doesn’t pretend vaccines work for everyone, or that they are not harmful for “a few.” Those few are not just numbers, they are unique individuals, and their lives are as important as any others. Doesn’t that tell us something? Yet now, some doctors are saying that, even when those children clearly identify themselves as being vulnerable to adverse response to vaccines, they should continue to be vaccinated? That is the kind of public health policy that doesn’t make sense and only adds to the concern parents have about the safety of vaccines. Why should parents trust doctors when they dismiss the children who suffer vaccine reactions as not worth protecting from harm? 1 Wolters Kluwer Health. Repeat Vaccination Is Safe for Most Kids with Mild to Moderate Reactions. News Release Sept. 14, 2018. 2 Zafack JG, et al. Rate of Recurrence of Adverse Events Following Immunization: Results of 19 Years of Surveillance Ii Quebec, Canada. The Pediatric Infectious Disease Journal (not yet published but available to view as PDF) Sept. 10, 2018. 4 Institute of Medicine Vaccine Safety Committee. Need for Research and Surveillance. (p. 305 & 307). Adverse Events Associated with Childhood Vaccines: Evidence Bearing on Causality; Washington, DC: The National Academies Press 1994. 5 Institute of Medicine Committee on the Assessment of Studies of Health Outcomes Related to the Recommended Childhood Immunization Schedule. Summary: Health Outcomes (p. 5-6) and Conclusions About Scientific Findings (p. 11) and Review of Scientific Findings (p. 75-98). The Childhood Immunization Schedule and Safety Stakeholder Concerns, Scientific Evidence and Future Studies; Washington, DC: The National Academies Press 2013. 6 Institute of Medicine Committee to Review Adverse Effects of Vaccines. Evaluating Biological Mechanisms of Adverse Events: Increased Susceptibility. Chapter 3 (p. 82). Adverse Effects of Vaccines: Evidence and Causality; Washington, DC: The National Academies Press 2012. 7 Fisher BL. Vaccine Safety: Evaluating the Science Conference. NVIC Newsletter Jan. 3, 2011. 8 Institute of Medicine Immunization Safety Review Committee. Executive Summary (pg. 4). Multiple Immunizations and Immune Dysfunction. National Academy of Sciences 2002. 4 Responses to "Doctors Claim it is Safe to Vaccinate Kids Even After Vaccine Reactions"
We have the ability to determine the genetic susceptibility that predisposes a child to a vaccine adverse reaction – so why don’t we insist that our children be tested before being given any vaccines? This kind of backward thinking makes me furious. I have a child who after a DPT shot went into convulsion in the Dr’s office. He instantly developed a fever of 108. He was hospitalized for a week. The aftereffect? He is unilaterally hearing impaired. So no, the vaccinations stop right there. Risks are relatively Low? Relative to what? 2. a 1 in 30 chance of having a worse reaction. Since worse reactions are typically touted to be “1 in a million”. An increase risk ratio of 30000 seems relatively high. Note also that the autisim rate is nearing the same ratio of 1 in 30. Yeh, let’s just add salt to the wound. Stupid, damn doctor! They sure wouldn’t say that if someone had a reaction to penicillin or bee sting.